Columban Fr. 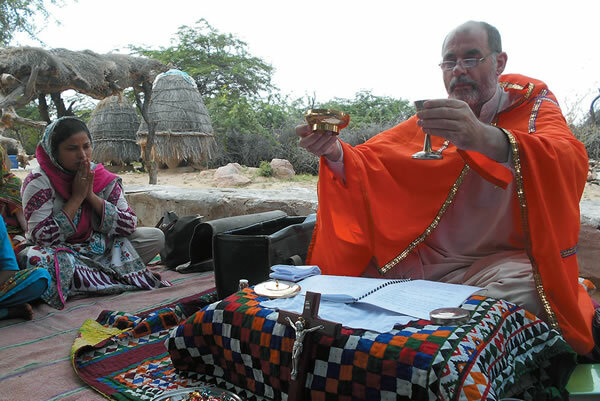 Tomas King celebrates Mass in a Pakistani village. As a Columban mission sponsor, you play a vital and important role in bringing Christ to the people of the Pacific Rim, South and Central America. You may not be able to go where our Columban missionaries go, and you may not be able to do what we do, but together we can bring Christ, in word and in sacrament to the people of the world. What Columban missionaries achieve is as much your work as theirs. When you choose to make sustaining gifts as a Columban mission sponsor, you help secure the future of mission! What are the personal benefits for you? Becoming a Columban mission sponsor is one way of saying “Thank You, Lord” for all of God’s goodness to you, especially for the gift of Faith. You can be sure that, in return, God will never be outdone in generosity toward you or your loved ones. By helping bring Christ to others, you will find your own faith immensely enriched. Our thank you gifts are a great way to help spread the word about Columban mission. Please consider becoming a monthly mission sponsor today and give hope to those most in need. Sustaining members provide dependable financial support on a monthly ongoing basis. As a mission sponsor, you will join other caring members who provide dependable financial support on a continuing monthly ongoing basis to help those most in need. By using these items with our logo on them, you are helping raise awareness for Columban mission! Please help us reach the people around you by using this thank you gift.